See the hot tips and breaking news this past week. What comment reply notification plugin do you use? Let me know asap so I can get it into my test list!! Tests are underway for the new case study and comparisons of comment reply email notification plugins. The tests will be going on for the month of October and I’ll have a post with the results. Thank you so much to the 20+ folks that signed on to become official testers!!! The internet is made up of wires and hubs and that infrastructure is old. I’m hearing lots of reports of connection issues. It may be the infrastructure or software is being updated. Or, we have massive botnets on the prowl. Having a Gravatar account is how you get your happy face to show up next to your comments on blog posts. I’ve got an old post on it, but Gravatar has changed since then. Seems like a good time to write a new post. Successful site owners never miss a Tips Tuesday!! 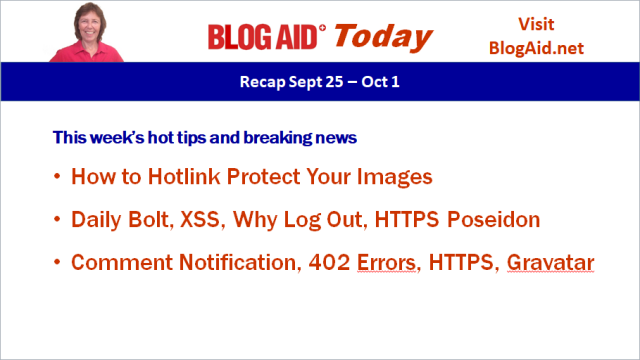 Subscribe to BlogAid News and/or all blog posts.